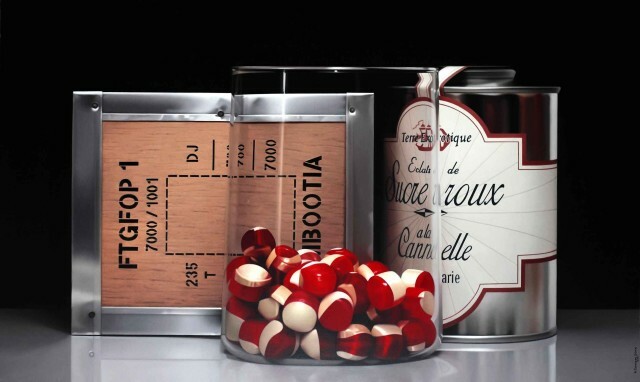 The hyperreal paintings of Spanish artist Pedro Campos shock the senses by giving mundane items a new lease of life. His subjects, often reflective in nature such as plastic-wrapped fruit, aluminium drink cans or glass marbles, possess an aura of glossy, sanctified perfection. There are elements of "Pop" in Campos' still life paintings - his jars of brightly coloured jelly beans would appeal to Wayne Thiebaud, while his large scale depictions of Coca Cola and Campbell's Soup cans bear a likeness to the iconic work of Andy Warhol. However Campos' personal distinction, the ability to create works of extreme clarity using traditional realist techniques, links him to Old Masters Francisco de Zurbaran and Jan Van Eyck. With his intricate skill, augmented by experience in art restoration, Campos is meditated deeply on the presence of things and endows each item he paints with a hint of the metaphysical. Restoration also taught Campos to strive for an "overall reality" and to subdue his brushwork. Although his art relies on photography, Campos goes beyond the photographic to create a distinctive oil on canvas aesthetic that is his alone. Campos did not have his first solo exhibition until 1998, when he had a showing in Salamanca and A Coruña. The results of this were so encouraging that the following year he determined to give up all other activities and become a full-time painter - and with considerable success. His meticulously executed snatches of the real world are executed with the minute precision of higher mathematics; and yet what seem to be very cool, unemotional artworks, embracing a quietist aesthetic, turn out to set off an intensely emotional experience. What begins in mathematics, ends in a subtle and a virtually indefinable magic.